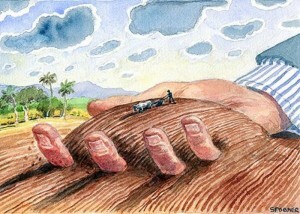 The World Bank has recently introduced principles for what it calls ‘Win Win’ land grab investment strategies. Investors win – cheap land and cheap food and cheap water!. Local landowners win – money! But the people who’ve been fighting the landowners for generations for the right access to the land on which they work everyday? Not so much of a win for them. Of course, they’ve never really been part of the equation in the first place. The principles that the Bank has offered shore up the status quo, treating the principle of private property as immutable, and its distribution as legitimate (no matter how bloodily it was acquired). The status quo is, in other words, the problem. Those excluded from it have been campaigning hard for radical changes, but the only winners here are those with money and those with land. Those with neither aren’t invited to table. A coalition of peasants, landless people, pastoralists and food justice campaigners has taken issue with this, the Bank’s latest attempt to gild rural injustice with the language of ‘development’. Here’s their indictment of the Bank’s policies. State and private investors, from Citadel Capital to Goldman Sachs, are leasing or buying up tens of millions of hectares of farmlands in Asia, Africa and Latin America for food and fuel production. This land grabbing is a serious threat for the food sovereignty of our peoples and the right to food of our rural communities. 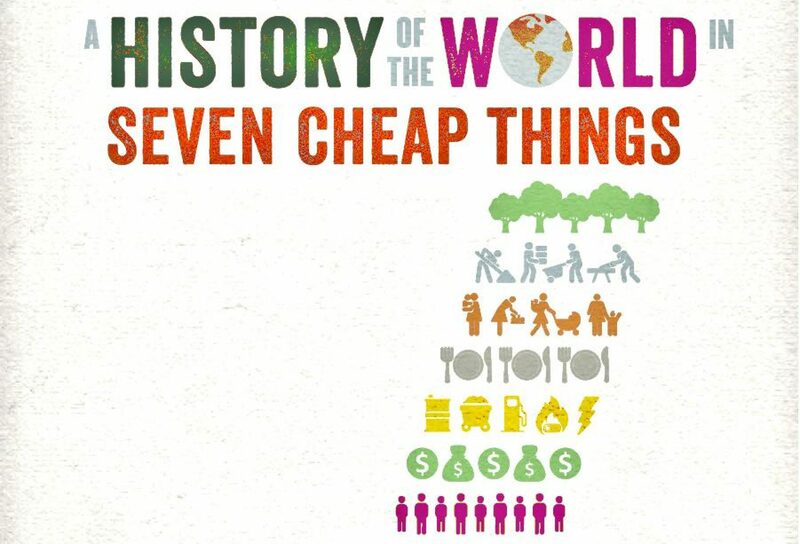 In response to this new wave of land grabbing, the World Bank (WB) is promoting a set of seven principles to guide such investments and make them successful. The FAO, IFAD and UNCTAD have agreed to join the WB in collectively pushing these principles. Their starting point is the fact that the current rush of private sector interest to buy up farmland is risky. After all, the WB has just finalised a study showing the magnitude of this trend and its central focus on transferring rights over agricultural land in developing countries to foreign investors. The WB seems convinced that all private capital flows to expand global agribusiness operations where they have not yet taken hold are good and must be allowed to proceed so that the corporate sector can extract more wealth from the countryside. Since these investment deals are hinged on massive privatisation and transfer of land rights, the WB wants them to meet a few criteria to reduce the risks of social backlash: respect the rights of existing users of land, water and other resources (by paying them off); protect and improve livelihoods at the household and community level (provide jobs and social services); and do no harm to the environment. These are the core ideas behind the WB’s seven principles for socially acceptable land grabbing. These principles will not accomplish their ostensible objectives. They are rather a move to try to legitimize land grabbing. Facilitating the long-term corporate (foreign and domestic) takeover of rural people’s farmlands is completely unacceptable no matter which guidelines are followed. The WB’s principles, which would be entirely voluntary, aim to distract from the fact that today’s global food crisis, marked by more than 1 billion people going hungry each day, will not be solved by large scale industrial agriculture, which virtually all of these land acquisitions aim to promote. Land grabbing has already started to intensify in many countries over the past 10-15 years with the adoption of deregulation policies, trade and investment agreements, and market oriented governance reforms. The recent food and financial crises have provided the impetus for a surge in land grabbing by governments and financial investors trying to secure agricultural production capacity and future food supplies as well as assets that are sure to fetch high returns. Wealthy governments have sought to lease agricultural lands for long periods of time to feed their populations and industries back home. At the same time, corporations are seeking long term economic concessions for plantation agriculture to produce agro-fuels, rubber, oils, etc. These trends are also visible in coastal areas, where land, marine resources and water bodies are being sold, leased, or developed for tourism to corporate investors and local elites, at the expense of artisanal fishers and coastal communities. One way or the other, agricultural lands and forests are being diverted away from smallhold producers, fishers and pastoralists to commercial purposes, and leading to displacement, hunger and poverty. With the current farmland grab, corporate driven globalisation has reached a new phase that will undermine peoples’ self-determination, food sovereignty and survival as never before. The WB and many governments see land and rights to land, as a crucial asset base for corporations seeking high returns on capital since land is not only the basis for producing food and raw materials for the new energy economy, but also a way to capture water. Land is being revalued on purely economic terms by the WB, governments and corporations and in the process, the multi-functionality, and ecological, social and cultural values of land are being negated. It is thus more important than ever that these resources are defended from corporate and state predation and instead be made available to those who need them to feed themselves and others sustainably, and to survive as communities and societies. Land grabbing – even where there are no related forced evictions – denies land for local communities, destroys livelihoods, reduces the political space for peasant oriented agricultural policies and distorts markets towards increasingly concentrated agribusiness interests and global trade rather than towards sustainable peasant/smallhold production for local and national markets. Land grabbing will accelerate eco-system destruction and the climate crisis because of the type of monoculture oriented, industrial agricultural production that many of these “acquired” lands will be used for. Promoting or permitting land grabbing violates the International Covenant on Economic, Social and Cultural Rights and undermines the UN Declaration on the Rights of Indigenous Peoples. Land grabbing ignores the principles adopted by the International Conference on Agrarian Reform and Rural Development (ICARRD) in 2006 and the recommendations made by the International Assessment of Agricultural Science and Technology for Development (IAASTD). 1. Keep land in the hands of local communities and implement genuine agrarian reform in order to ensure equitable access to land and natural resources. 2. Heavily support agro-ecological peasant, smallhold farming, fishing and pastoralism, including participatory research and training programmes so that small-scale food providers can produce ample, healthy and safe food for everybody. 3. Overhaul farm and trade policies to embrace food sovereignty and support local and regional markets that people can participate in and benefit from. 4. Promote community-oriented food and farming systems hinged on local people’s control over land, water and biodiversity. Enforce strict mandatory regulations that curb the access of corporations and other powerful actors (state and private) to agricultural, coastal and grazing lands, forests, and wetlands. No principles in the world can justify land grabbing! Thank you for posting this. One of the most damaging elements of the current growth model of economics is the ongoing and intensifying exploitation of the remainder of natural resources by corporate interests at the “commodity frontiers”. As long as this system , market fundamentalism, forms the basis of how development policy is created, this destructive process will continue. Taking back the economy is critical – redesigning it and freeing it from the absurd illusory belief that it can and must grow forever, benefiting a tiny percentage of the population. Raj, thank you so much for this entry. This land grab is happening all over the world and has been happening for many years. Many of us have become discouraged because it seemed that no one cared and those who did were suppressed and marginalized. This great issue is symptomatic of the present selfish world-paradigm of total control over every aspect of human life. It will collapse as more and more of us speak out and demand sanity, simply because it is 100% contrary to Mother Nature and the most basic of human rights. These despots worship money as their god and think they can buy the bodies, minds and souls of men, but they are mistaken and are on a downward spiral to their own self-destruction. “Business as usual” is completely unsustainable, counterproductive, greedy, war producing, unjust, evil and to put it bluntly, completely insane. Even clinically insane. Your focus and sharing of information, which many of us did not know, is not only encouraging but kindels a flame of real practical hope in our hearts. This makes SENSE. It is logical, just, practical and RIGHT by the most basic Universal human ethics. And it WILL succeed regardless of the greedy adversary who thinks it can own the world. When exactly did the World Bank “recently introduce principles for what it calls ‘Win Win’ land grab investment strategies?” Check your facts – you don’t know what you are writing about. The four action points mentioned are good. Add to them the public collection of community created land value via shifting property and other taxes to land values only, a public tax policy in practice and being seriously considered in many places. As much as possible public revenues should come from assessment against land values all of which, 100%, are created by and only by the community as a whole. This only makes common sense when it is understood as does every economist who ever considered the subject that public services have the effect of increasing the value of land, only land, and not improvements. If this is not obvious and is news to you, go back and ask you economics professors why they did not tell you this. Is it not the most fundamental fact rarely spoken of that land is being grabbed to cash in on not only the natural fertility and qualities of land but on the economic value given to land and natural resources by all humanity. The very existence of human beings gives value to land because of our absolute need for access to land for survival and not to speak of thriving. Land owners have the hutzpah to charge us, the ones who give it value, a price for access to our own planet. The more of us who show up, the higher the price of land and the greater the land rent to earth’s monopolizers. Can you dig the absurdity of this? Peasants and indigenous “uneducated” people sure can. It’s us educated ones who are blind to this, so far anyway. Private collection of land value not created by individuals is the free lunch of which there is not supposed to be any. It is the one clear indisputable flaw in the concept of free market capitalism. There is no argument about this and that is why you never hear any discussion about it since to discuss it at all would be to blow the lid off of it. Inexplicably it is not spoken of openly while all sorts teeth are gnashed over “greed” without ever specifying the most obvious aspect of it: the getting of something for nothing inherent in private “ownership” of land value. There is nothing wrong with private ownership of land that collecting its community created value to pay for public services would not cure. When this is done land will only be sought after to put it to productive USE and never as an investment and never for speculation. Investment will have to then shift to truly productive endeavors like recapitalizing America’s industrial sector, i.e. the real economy. The abusers and monopolizers of the earth will be driven out and cease to exist once they cannot keep the free lunch that the rest of us literally give away to them. As long as private “owners” including we small holders are allowed to keep the community created value of land, a value we do not create except as equal members of the larger community, there will always be overwhelming incentive for the big players to grab and monopolize land. I say humanity has forfeited the right to privately collect this value that only the community creates. This idea is the modern version of how indigenous peoples treated the land, as commonly owned. In a modern economy private ownership for USE is necessary because of the massive investment in permanent improvements on land but what is and should be commonly owned is the commonly created value of land. This is not hard to grasp is it? People are now talking about the commons and what is more the “commons” than the commonly created value of privately held land and natural resources? Are these folks who talk about the commons too timid to extend the concept to land value commonly created? So far, yes. And why? Is it not the resistance of we micro land “owners” to the loss of the opportunity to play the land speculation game that has heretofore prevented serious consideration of this idea. Little people hoping to emulate the big guys all voting against their own best economic interests hoping to grab some profits from the value of their land value increasing. The big guys love this don’t you know. They depend on mom and pop retirees to defend their vast monopoly holdings of the body of our Mother. I was there when one skirmish in this battle was won by the big guys in 1979 in California known as Proposition 13. It was billed as a measure to benefit the little people and the result was that it instantly benefited big landholders mostly corporations that never die by permanently lowering the taxes that fell on their land values. Today property taxes, the only taxes that fall directly on land values are the most reviled taxes. Lookm to California to see what happens when the property tax as flawed as it is because of that part of it that falls on improvements is undermined. Land value is the birthright of all humans as equal members of community and is the proper source of revenue to fund community for the equal benefit of all. By taxing the value that all of us create as community we can stop taxing individually earned incomes from labor and real capital investment, shut conservatives up by agreeing with them to the extent that they are correct in their complaints against unjust taxation while taking back the earth from them (and of course those good hearted liberals who love to speculate with land, i.e. some of us who read this stuff by Raj Patel).